On 2 July 1814, Acasta was among the vessels sharing in the capture of the schooner Little Tom and her cargo of lumber, plank, and shingles. 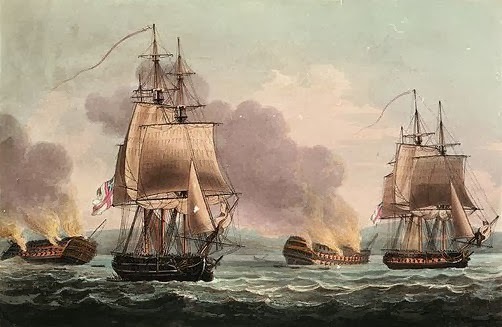 Multiple ships shared the capture, they were Albion, Dragon, Acasta, Severn, Loire, Narcissus, Jaseur, and St. Lawrence. The London Gazette: no. 17209. p. 89. 14 January 1817. American schooner Prudence, of 4 men and 17 tons, captured by the Acasta; arrived at Halifax in July. Stephanie, schr., 71 tons, 1 gun, 9 men, F. W. V. Reynegom, master, Philadelphia to Havannah, captured July 16, 1814 by Acasta. Cargo flour, lard and onions. Arrived at Halifax July 22nd. Diana, sloop, 69 tons, Wm Paynter, master, Philadelphia to Havannah, captured July 19, 1814, by Acasta. Cargo: 480 bbls. flour. Arrived at Halifax July 27th.